It's kind of funny, but I wrote my June blog post before the end of the month, and this post is coming afterwards, which means this is almost six weeks of budget versus four. I almost couldn't believe this Rosé in the USA tote was supposed to be included in my July budget since it feels like I bought it so long ago. Don't worry though, Old Navy currently has a lot of cute totes that aren't USA themed if you're looking for something fun to carry around. 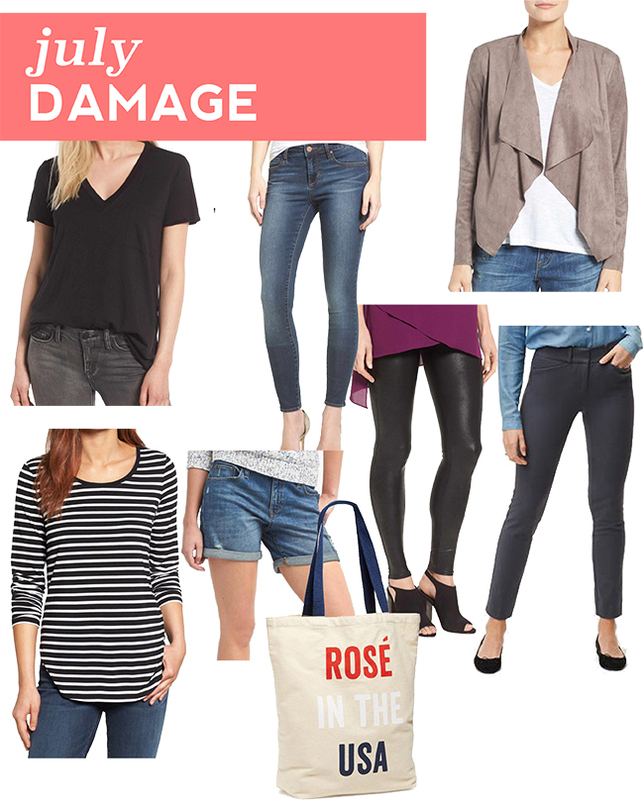 I did a ton of shopping online this month thanks to the Nordstrom Anniversary Sale, but the majority of it is actually going back so this budget post feels a little empty considering how much I bought. I did get the faux-leather leggings in the mail as I was pulling stuff together for this post, and they're so good I had to add them in. I also ended up buying these booties since I decided to return the other pair I bought (waterproof, but the stitching rubbed my ankles too much to ignore) but they haven't come in the mail yet, I'll let you know what I think once I get them! So, on to what I bought in July! Lush Raw Edge Tee - originally $24, on sale $15.90. I originally passed over this tee because I don't love raw edges and I was worried it would be too thin & flimsy, but after seeing numerous good reviews I decided to give it a try. You guys. I literally took it out of the box, put it on my body, and wore it two days straight. The drape is perfect, the v-neck somehow isn't too deep on me, and the fabric isn't tissue thin. Win win win. Articles of Society Skinny Jeans - originally $59, on sale $38.90. I needed some new jeans, and I love these. My waist is my trouble-spot, and these have plenty of room at the waistline. They're also super stretchy but don't stretch out, and are really slim around the ankles. Kut from the Kloth Faux Suede Jacket - originally $88, on sale $58.90. This was definitely my favorite purchase from the sale. It looks like a jacket, but it's so soft and comfortable it feels more like wearing a cardigan. I ended up wearing it over the weekend thanks to a temperature dip, and it's seriously so perfect. If it comes back into stock definitely snag it!! Halogen Tunic - originally $39, on sale $24.90. I always want more tunics to wear with leggings, and more stripes, and this fit both of those needs ;) Still available in a couple of colors! Gap Boyfriend Shorts - originally $49.50, on sale + used rewards $20.77. These were to replace a pair I bought a few years ago, and they're just as good now as they were back then - somehow oversized but still flattering. Definitely my favorite shorts! Old Navy Tote (other cute tote options) - originally $8.95, on sale $8. I carried this all month long - yay for rosé! I saw a bunch of other totes when I was in the store last week and they are all super adorable! Spanx Faux Leather Leggings - originally $98, on sale $64.90. I've heard good things about these leggings for the past couple of years, but there was no way I was spending a hundred bucks on leggings. $65 was much easier to swallow so I decided to give them a try, and you guys, they're so good. Super flattering, super comfortable, and really cute. I can't wait to wear them with my favorite OTK boots this fall! LOFT Skinny Ankle Pants - originally $69.50, on sale $34.75. I've been looking and looking for a new pair of dress pants, and this pair is great! Really stretchy, not too wide in the leg, and really comfortable. Oh, and they aren't black like my other dress pants, but instead this pretty gray/blue color. I've been doing a lot of presentations at work lately, and these will definitely help me feel confident! Yahoo, under budget! You may have noticed this pair of flats was excluded from my list, it's mainly because I'm still not 100% I'm going to keep them. I haven't found a reason to wear them yet, and if that continues they're going back. I really can't believe we're getting into August now! I don't really have any big holes in my wardrobe at the moment, although I am still looking for a new winter coat. I'll keep you posted!